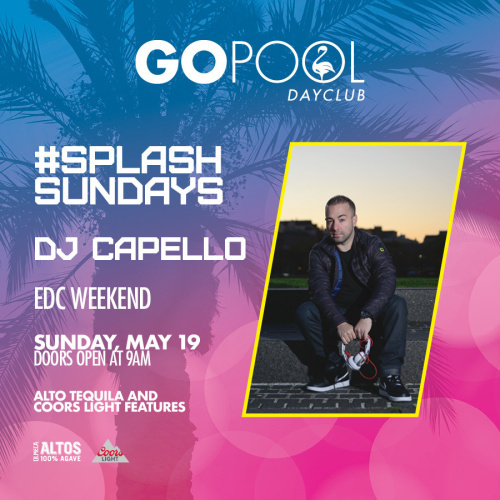 THE GO POOL PROUDLY PRESENTS SPLASH SUNDAY. CELEBRATE EDC WEEKEND WITH CELEBRITY GUEST DJ CAPELLO. DOORS OPEN AT 9AM WITH ALTO TEQUILA SPECIALTY COCKTAIL PITCHER, AND BOTTLE FEATURES ALONG WITH COORS LIGHT BUCKET FEATURES 9AM -NOON.